Announcement Free Shipping for all domestic orders $25 or more! Free Shipping for all domestic orders $25 or more! Celebrating a love for fashion, the written word, and yoga, all in one shop! For over 10 years, Jewelry by Jakemi has been creating quality and affordable handmade jewelry. We specialize in using words to make jewelry. 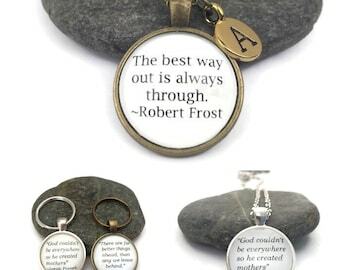 We make glass tile pendants featuring inspirational quotes, proverbs, or bible verses. 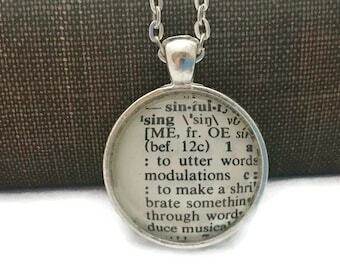 We also make dictionary pendants . We have words to describe personal traits, professions, mantras, or heritage. Because our definitions are cut directly from a vintage dictionary, you can be assured that each piece is one of a kind. We do not photocopy or computer generate our definitions. We have recently added the option of personalizing our quote and definition necklaces. Yoga enthusiasts will love our chakra bracelets made with a variety of gemstones. We use beading wire and toggle clasps for added durability. Most other yoga bracelets are made with stretch cord which is more likely to break over time. Check out the shop often. New items are added often. You never know what you’ll find!